An excellent recipe for cold or cloudy days. Having a few friends round and the weather's not to good, perhaps they want to watch the football and perhaps you do too! This recipe requires little attention and is easy to barbecue while you watch the match. 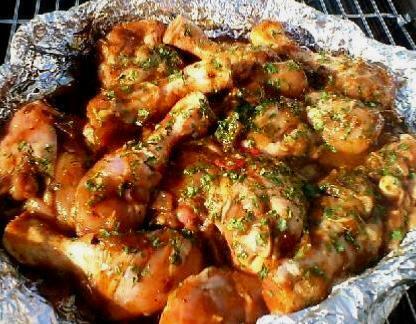 Purchase enough chicken to allow 3 pieces each, try a mixture of chicken drumsticks and thighs. With a sharp knife carefully cut or slice the chicken part way through, this will allow the flavours to penetrate the meat during cooking. Make a large boat with 2 layers of silver foil. Pour the sauce into the boat and add the garlic. Toss the chicken in the mixture to coat, sprinkle with the parsley and leave to marinate for an hour or more (overnight is best). 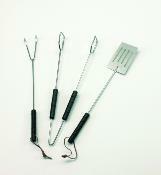 Prepare and light the barbecue to cook indirectly (there is no need for a drip tray). Season the chicken and carry to the barbecue on a tray. 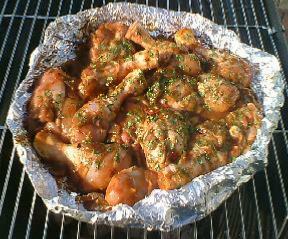 Place on the barbecue (indirect method) and close the lid. leave for 45 minutes, keeping one eye on the barbecue and one eye on the match. At half time open the lid, turn the chicken pieces with tongs and adjust the boat to ensure even cooking. At the final whistle, carefully remove the chicken from the barbecue onto the tray. Serve with oven chips and French or garlic bread. If you wish to make it a little hotter, add curry powder to the mixture before cooking. Can be chargrilled over hot coals to finish.